Good Golly Miss Dolly sells 7"-10" / 18-26 cm vintage dolls, dating from the 1950's-1990's, and a complete little world for them to inhabit. It's a world centred on little girl dolls, who wear gorgeous vintage clothes and live in rooms furnished with antique or vintage items. Because their rooms are realistically furnished, the dolls can get dressed, read books, have tea and cake with friends, dig gardens, and play with toys - just like real little girls. This wonderful little building came our way and we just couldn’t resist it! 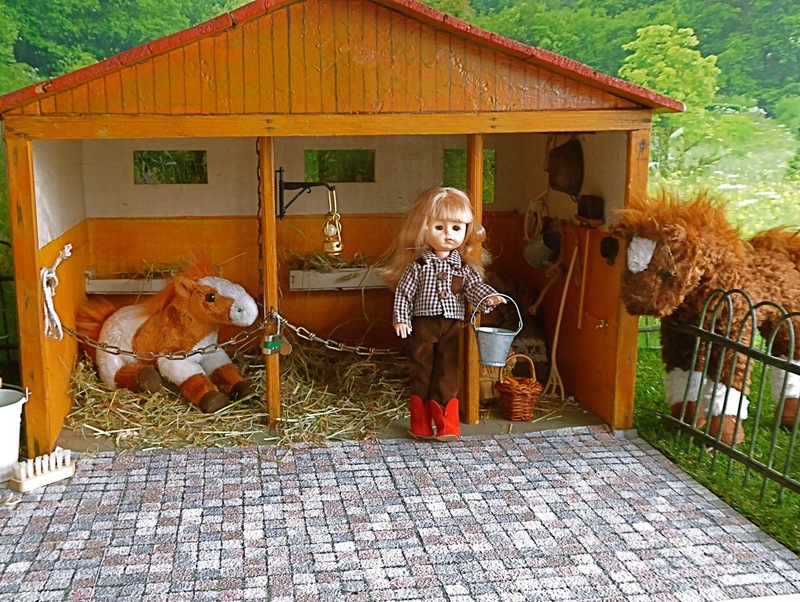 The wooden stable building itself was hand-crafted decades ago, but we have added lots of accessories and surroundings to make a very realistic stable yard, hopefully to delight some lucky young horse-lover today. The idea is that little girls should play with little girl dolls (like themselves), rather than absurdly-curved women, or plumped-up adolescents. We believe that childhood should remain a time of innocent pleasures. Our dolls and all their possessions will last for generations if given a little care. Vintage toys are sometimes called "heritage toys" - created for children to play with long ago and still inspiring imaginative play today. These toys are also environmentally-friendly, in that most of the components of the room sets are recycled or reclaimed vintage items, as are the dolls themselves and their clothes. The dolls are sold individually. Their clothes can be bought either as a complete wardrobe or as individual items - please see the CLOTHING section of this website. Alternatively, a little capsule wardrobe and a doll comes with each of our dressing rooms, so starting with a dressing room is not only an economical beginning, but also a satisfying way to begin your collection. Our rooms are sold individually too - choose from kitchens for cooks, bedrooms for sleepyheads, sitting rooms for socializing, dressing rooms for divas, even gardens for the green-fingered. Just click on the categories above to see the all the rooms in that section. How do we arrive at our prices? Please note that each room set is unique. There will be no others like it. Our prices are based on what we have paid for each item in the room set, and we make each room set to the same high quality, regardless of the cost of its components. How to start your collection? We suggest that you start with a doll. And a few clothes. The most economical way to do this is to select a dressing room – that way you get a doll, her capsule wardrobe and a little room with hanging space for her clothes and a piece of furniture. The next item might be a bedroom to go with the dressing room you’ve chosen. (They don’t have to match, but they should look nice when placed side-by-side.) Next might be a kitchen or dining room. And finally, a sitting room, or garden?